Classes at CrossFit Long Haul run for one hour. In this hour we will work on a selection of Strength, Skills, Conditioning and/or a WOD (Workout of the Day). All classes include good banter and good coaching! Every class is designed carefully to cater to all fitness levels so don’t stress if you’re a beginner – our coaches will be with you every step of the way to teach you how to safely and effectively perform each movement. Our members are everything to us, our #1 priority is ensuring you have a good time and get a high quality workout, suited to your abilities. If you skip a few classes, you can expect a phone call from your coach checking in on you. If you haven’t learnt a movement yet, you can expect your coach to spend time teaching you and ensuring you’re comfortable for the workout . If you don’t know anybody, you can expect to have a bunch of new friends by the end of your first class. No one is ever left behind at CrossFit Long Haul and our members love it here! The best way to get started is with your No-Sweat intro session. Anyone interested in our gym starts here, it’s a chance for us to learn about you and your goals and a chance for you to check out the gym and find out which programs will suit you best. Our Intro sessions are free and come with no obligations – why not come and check it out? We take our coaching very seriously, we want to make sure our members move safely and effectively for their goals. We encourage members to begin with a few one-on-one sessions before jumping into classes, this gives us the opportunity to get you comfortable with any movements you haven’t done before and work through any personal challenges you face. This is the perfect starting point, for beginners or those just looking to add variety to their training, start on our 3 sessions per week option to ensure you get a well rounded program and get to know your classmates! This option is for those serious about their goals or who are struggling with injuries. 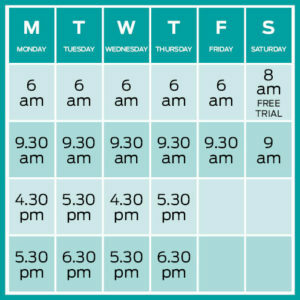 Package includes full access to the timetable as well as a one-on-one Personal Training session weekly to knuckle down on individualised work to get past those injuries or reach your goals faster!